Fenders - Steel Diamond Plate. Tires and Wheels Silver Mod. Tires and Wheels White Painted. Boat Trailer Kodiak Disc Brake Kit Single Axle Complete with Titan M60 Actuator. This listing is for a Complete Disc Brake Assembly kit that includes everything needed to mount disc brakes to a boat trailer that is running a single axle hydraulic disc brake system. From Front to Back, we have included all the needed hardware and parts for replacing an existing disc brake system, or to start fresh with disc brakes on your trailer for the first time. This system will outfit Leaf Spring and Torsion Axles. This is a Hydraulic Disc Brake System that uses surge action to apply the brake pressure. In short, when your vehicle brakes are applied, the Surge Actuator compresses because of the forward "surge" created, which applies pressure to the hydraulic fluid, forcing it through the brake lines to the calipers, which compress on the brake rotors, and slow down your trailer. This process is extremely effective, and the most efficient way to have brakes on your boat trailer. What makes this kit we have put together so unique, are the components included. We have included a Titan Brand Surge Actuator, Stainless Steel Mounting Bolts, Kodiak DOT Rated Flexible Brake Hoses, and Kodiak Brand Disc Brakes with Stainless Steel Backed Disc Brake Pads. This Disc Brake kit is for 3500 lb trailer axles with a 4 Hole standard brake flange mounted to the axle. If your axle does not have this brake flange, you will not be able to mount brakes to your trailers axle. A standard 3500 lb Axle uses 1 3/8" x 1 1/16" Wheel bearings, and a 1.712 Grease Seal, we include the wheel bearings and grease seals in this kit as well. From Front to Back Whats included. &###xA0;- Titan Brand Model 60 7,000 lb Capacity Disc Brake Surge Actuator with Reverse Lockout Solenoid Pre-Installed and Protective Shield that uses a 2 Towing Ball and mounts to a 3 inch wide trailer tongue. &###xA0;- (2) 1/2 inch x 4 1/2 inch Stainless Steel Mounting Bolts with Hardware for bolting your Surge Actuator to your Boat Trailers 3 inch wide trailer tongue. &###xA0;- Kodiak Brand DOT Rated Single Axle Brake Line Kit, complete with. &###xA0;- 20 ft Main Line to connect to the Reverse Lockout Solenoid. &###xA0;- Brass T Fitting. &###xA0;- 18 Trailer Brake Hose to Caliper. &###xA0;- 7 ft Trailer Brake Hose to Go Across Axle to opposing Caliper. &###xA0;- (9) Push Mount Screw in Cable Ties. &###xA0;- (9) Standard Cable Ties. &###xA0;- Kodiak Integral All Dacromet Kodiak 5 Lug Disc Brake Kit complete with. &###xA0;- (2) Caliper Brackets. &###xA0;- (8) Stainless Steel Caliper Bracket Mounting Bolts. &###xA0;- (2) Kodiak Dacroment 225 Calipers with Stainless Steel Backed Brake Pads and Stainless Steel Caliper Bolts. &###xA0;- (2) Dacromet Integral Disc Brake Rotors 5 Lug (5 on 4 1/2 pattern which is standard) with 3500 lb Wheel Bearing Kits and Grease Seals. Wheel Bearing Kits use #68149 and #44649 Wheel Bearings, 1 3/8" x 1 1/16" Inner Diameter. &###xA0;- (2) 1.98 Zinc Plated Accu Lube Style Dust Caps. 10 Zinc Plated Standard 1/2 - 20 Lug Nuts. 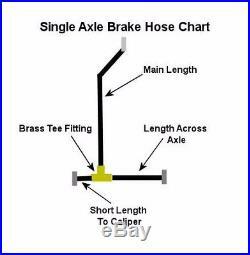 We have included an image of the Kodiak Brake Hose Layout in Picture form with this listing, which is very simple and effective. Sturdy Built Trailer Parts is a dedicated Family Business that has been offering the highest quality of Customer Service at the Best Prices since 1989. We are committed to our Customers both in our Retail Stores, and Online. Our Sales Staff is happy to assist you with any questions or comments you have about the products we offer. We are a Florida Based company, with an in depth knowledge of all types of trailers. Our Sales Team is trained on everything from Boat Trailers to Equipment Haulers. We do what you do, and we are here to help get your trailer back on the road. We additionally Have Two Florida Retail Store Locations For Local Customers as Well, Fully Staffed with Sales Team Members to Outfit all Your Trailer Needs. 6511 SR 64 E Bradenton, FL 34208 ------------ 4156 S. Tamiami Trl Sarasota, FL 34231. Please double check your order for accuracy. We have a Sales Staff in place to assist you with any questions or concerns you have. This listing is currently undergoing maintenance, we apologise for any inconvenience caused. The item "Boat Trailer Kodiak Disc Brake Kit Single Axle with Titan Model 60 Actuator" is in sale since Tuesday, November 17, 2015. 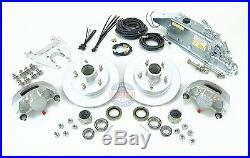 This item is in the category "eBay Motors\Parts & Accessories\Car & Truck Parts\Brakes & Brake Parts\Trailer Brakes". The seller is "sturdybuilttrailerpartsinc" and is located in Bradenton, Florida. This item can be shipped to United States, Canada, United Kingdom, Denmark, Romania, Slovakia, Bulgaria, Czech republic, Finland, Hungary, Latvia, Lithuania, Malta, Estonia, Australia, Greece, Portugal, Cyprus, Slovenia, Japan, Sweden, South Korea, Indonesia, Taiwan, South africa, Thailand, Belgium, France, Hong Kong, Ireland, Netherlands, Poland, Spain, Italy, Germany, Austria, Mexico, New Zealand, Singapore, Switzerland, Norway, Saudi arabia, Ukraine, United arab emirates, Qatar, Kuwait, Bahrain, Croatia, Malaysia, Brazil, Chile, Colombia, Costa rica, Panama, Trinidad and tobago, Guatemala, Honduras, Jamaica.